There are many people these days that still use a Mac as their primary home computer. There are also a number of businesses that to some degree rely on using a Mac to perform some of their small office functions. For those who are looking for a printer, you will be happy to know that most of all the printers on the market include drivers for Mac that will make it easy to set them up and use them from any Mac. With so many people working from home and setting up a home office, they are often in need of a way to print, copy and scan a variety of documents. This is where today’s all-in-one printer comes in handy. These devices are capable of performing all three functions with the same printer and even some on our list that is capable of faxing as well. We did quite an extensive amount of research for this article and we discovered a number of really good printers on the market and came up with the best printer for Mac that we could find. We also included printer reviews for all of the ones that we found. 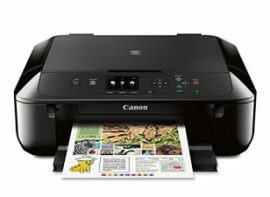 Canon has been making personal home printers for many years and their inkjet models are some of the most popular on the market. The all-in-one printer is extremely versatile and is really helpful for today’s household, especially for those who are still using an Apple Mac or Apple iPhone. Canon MX922 is capable of delivering high-quality photo prints as well as simple black and white text. The MX922 All-in-one printer features printing, scanning, copying and faxing all within one compact device. The copying, faxing and scanning all use the flatbed scanning engine and glass that is located underneath the top cover. For multiple page documents, you can load up to 35 sheets of paper into the auto document feeder on top of the printer. The high-quality photo prints are created using the 5-color ink cartridge/printhead system, which features five individual ink tanks that can be replaced separately. One of the most important features of the MX922 is the built-in WiFi which makes it possible to hook it up to all of the household computers and mobile devices. 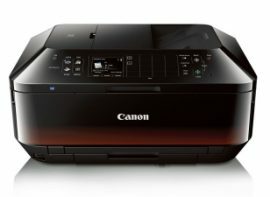 The Canon Office and Business MX922 All One Printer is a great choice for anybody who is using a Mac at home, it comes with the necessary drivers to load on any Mac. The OfficeJet 4650 All-in-one Photo Printer is one of the top inkjet printers on the market. 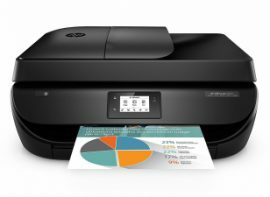 HP has been making inkjet printers for individuals and commercial users for many years and the OfficeJet 4650 wireless printer is one of the most versatile HP has to offer its Mac users. It can print photos, scan, copy and fax all from the same machine. The built-in wireless LAN means that you can connect all of the household Mac’s and also mobile devices. The set up is extremely easy and only takes a few minutes and you will ready to print from any of your devices. The operator panel has an easy to use touchscreen which helps to make the set up much quicker. The multi-sheet document feeder works with the scanning, faxing and copying to allow for up to 35 pages to be fed without having to reload it. The main input paper tray holds up to 100 pages of 8.5″ x 11″ plain paper. However, it can also be used to feed a wide range of other types of paper (photo paper, envelopes, and cardstock). 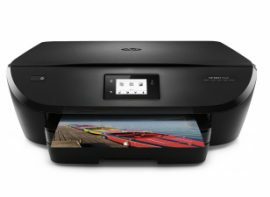 The HP OfficeJet 4650 Printer is high-quality inkjet printer from one of the most widely respected manufacturers of printers in the world. It would be a great choice for any Mac user. Brother is one of the fastest growing of the all the manufacturers on our list of 8 All-in-one printers. 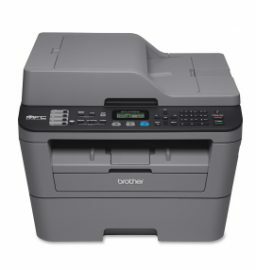 Brother designed this laser-class printer to be perfect for small office and home office (SOHO) and that includes printing from any Mac or iPhone. The built-in wireless LAN means that all of your household Mac’s and iPhones can easily share a single machine. The multifunction feature means that it can print, scan, copy and fax all from one single machine. The scanning, copying and faxing all use the flatbed scanner that is located underneath the top cover. It also features a 35 sheet auto document feeder that holds up to 35 sheets of paper. You can load the documents in the feeder and push the button on the operator panel and walk away. While it only prints in black and white, the built-in high-resolution scanner is able to scan in full color and send the document to your Mac. It can send directly to email, to a file and also as an image that can be edited using OCR. 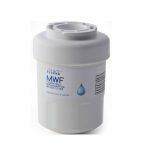 The Brother MFCL2700DW Printer is a great choice for a household or small office that does not need to print in color. Canon makes a number of different models of All-in-one multifunction color inkjet printers and the MG6820 is the middle of the road printer. It has a built-in WiFi interface that makes it easy to connect to your home WiFi network and it then can be shared by all of the machines in your home. This includes your Mac, Apple iPhones and iPads running most versions of OSX and iOS operating systems. The MG6820 inkjet printer is high-quality color inkjet printer that features 5 individual ink tanks that can be replaced separately. The built-in wireless technology means that you can share one printer with all of the Mac’s, tablets and smartphones in the household. This multifunction device can print, copy and scan from a single machine. The 100 sheet paper tray can handle a wide range of paper types and sizes from plain letter paper, #10 envelopes and a number of different size photo paper. If you are using photo type paper it will only handle 20 sheets at a time. Print speeds are fairly impressive with 15 images per minute black and white and 9.7 images per minute in full color. 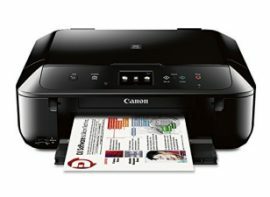 The Canon MG6820 Wireless All-In-One Printer is high-quality wireless inkjet printer that would be a good choice for any Mac user. The WF-2760 All-in-One Wireless Color Printer is one of Epson’s most technologically advanced inkjet printers. It features the exclusive Epson PrecisionCore print technology that produces near laser quality color printing. The prints speeds are relatively quick 13.7 pages per minutes black and white and 7.3 pages per minute full-color. The built-in WiFi interface allows it to connect directly to your home wireless network and share it with all of the computers including smartphones, and tablets. It also has a USB port and means you can also connect directly to your Mac instead of using the WiFi. Thanks to the 2.7″ color LCD touchscreen setting up the printer is extremely easy to set up with all of the devices on your home network. The Epson WF-2760 is a multifunction printer that is capable of printing, scanning, copying and faxing that makes it the perfect small office or home office machine. The 30 sheet auto document feeder means that you can load all your documents, push a single button, walk away and it scan or faxes all of the documents. 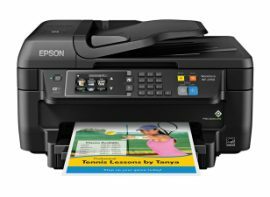 The Epson WF-2760 All-in-One Wireless Color Printer is one of the best overall printers on our list and it would be a great choice for anyone looking for a high quality printer. The Envy 5540 Wireless Printer is another high-quality all-in-one printer from HP. It is highly capable of delivering great quality photo images on either photo paper or plain paper. It is capable of wireless printing from any Mac or iOS enabled smartphone or tablet in your home. The setup is extremely easy and it will be ready to receive your prints in only a few short minutes, using the color LCD touchscreen on the operator panel. The HP Envy 5540 is compact, little tabletop printer that will fit in the smallest office or home office that is tight on space. It is capable of printing, copying, and scanning which also makes it perfect for the small office/home office environment. The easy to setup WiFi means that you can send to the printer from any WiFi enabled device or Mac that happens to be connected directly to your network router. The scanner is located just under the top cover and it is able to scan documents up to letter size (8.5″ x 11″) and it can scan to file, email and also copy in b&w and full-color. The input paper tray holds up to 100 sheets of plain paper and is also capable of holding envelopes and photo paper. The HP Envy 5540 Wireless All-in-One Photo Printer is the best value for an all-in-one Mac ready printer and it would be our favorite printer on the list. The MG5720 is great little budget size inkjet printer that can be used with your Mac or iOS enabled smartphones and tablets. It can easily be set up on your home office via the built-in WiFi interface using the large, 2.5″ color LCD touchscreen display located on the operator panel. There are also numerous one-touch buttons for several of the operations that make it really easy to use. The Canon MG5720 printer is a compact, yet a powerful little device that combines several different pieces of office equipment into one highly functional machine. It is capable of delivering photo quality images and great looking text, makeup to 999 copies of any original document in full color and scan to file, email in both b&w or color. The high-speed WiFi connection means that it can easily be shared with all of the Mac, smartphones, and tablets inside the home. It is capable of cloud, direct and print from any network device with just one touch. The Canon MG5720 Wireless All-In-One Printer is high-quality Mac ready printer that would make a great addition to any small office or home office setting. 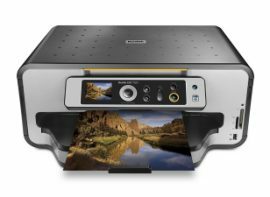 The ESP 7250 All-in-One Printer from Kodak, the name that is synonymous with photos and now photo quality inkjet printing. This printer is capable of printing a wide range of documents from plain letters on 8.5″ x 11″ plain paper to 5″x7″ superior quality, borderless photos. This little gem is fully WiFi enabled and can be connected to any Mac or WiFi enabled device on your home network. However, you are also able to print directly from any iPhone, iOS-enabled mobile device and also Android OS enabled smartphones and tablets. The compact size of the Kodak ESP 7250 means that it can easily be fit into your home office or small office and since it can do the same job as a separate flatbed scanner and copier machine, you will have plenty of room for other things in your office. The built-in WiFi interface means that you can easily connect it to your home network and also print directly from your smartphone or tablet as well as your network connected Mac. The Kodak ESP 7250 Printer is a pretty decent value in an All-in-one printer and it would work for any Mac user.